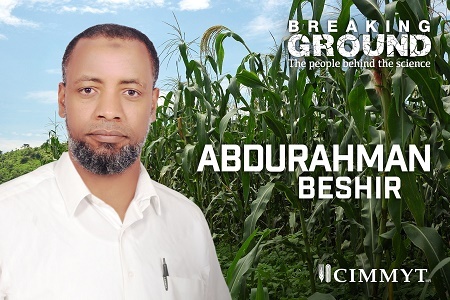 AbduRahman Beshir and his team are developing climate-resilient, biofortified and biotic stress-tolerant maize to enhance the maize seed sector. EL BATAN, Mexico (CIMMYT) – In Pakistan, maize is the third most important cereal crop after wheat and rice and it is the first in productivity among all the cereals. However, Pakistan imports about 90 percent of the hybrid seeds used to produce the crop, costing the country as much as $60 million annually. Furthermore, the genetic diversity of the currently available maize varieties is not diverse enough to adapt to the varied agro ecologies of Pakistan. To address these issues, AbduRahman Beshir, maize improvement and seed systems specialist with the International Maize and Wheat Improvement Center (CIMMYT), and his team, working under the U.S. Agency for International Development (USAID)-funded Agricultural Innovation Program (AIP) for Pakistan, are developing climate-resilient, biofortified and biotic stress-tolerant maize to enhance the maize seed sector. Almost half of children under age 5 are reportedly malnourished, Beshir said, adding that protein, vitamin A, and other micronutrient deficiencies in Pakistan are rampant, while the mortality rate is among the highest in South Asia. Beshir’s work targets these underprivileged groups and in the foreseeable future, he hopes to see nutritional benefits improve significantly. Throughout his life, Beshir has witnessed how small scale farmers are often unable to fulfill their basic needs as they struggle to get fair market prices for produce, in part due to middlemen and a lack of information in the market. He grew up in Ethiopia, a country where agriculture is the mainstay of the economy, accounting for 80 percent of employment, according to UNDP. The livelihoods of Beshir’s grandparents and most of his relatives were dependent on agriculture, but his parents switched to a sideline business selling agricultural and food related products. Earning an undergraduate degree in agriculture and plant sciences was a life changing experience for Beshir, serving as an eye opener to the dire need for educated agricultural professionals to transform the livelihoods of rural farmers. Beshir earned a Ph.D. in plant breeding from the University of the Free State, Bloemfontein, in South Africa, and was awarded a gold medal for his research project highlighting the severity of malnutrition in parts of sub-Saharan Africa and the ways quality protein maize seeks to address the issue. Before joining CIMMYT in 2013, Beshir was the national partner in Ethiopia for a CIMMYT-led project on quality protein maize development and drought-tolerant maize for Africa. “My involvement in these projects gave me a good grasp of how CIMMYT’s impact-oriented interventions practically change the life of farmers and brought a maize revolution in my country, in partnership with local institutions,” he said. His current work in Pakistan mainly involves extensive testing of various maize products sourced from CIMMYT breeding hubs in Colombia, Mexico, Zimbabwe and the International Institute of Tropical Agriculture (IITA). Since 2014, more than 2,200 maize entries have been tested through the project. Test samples consist of biofortified maize, as well as maize varieties that can tolerate major biotic and abiotic stresses, and they have been evaluated on more than 300 different sites in Pakistan. Such large scale testing is unprecedented in the history of maize in Pakistan. Beshir’s led efforts resulted in the allocation of 49 market ready maize products (hybrids and OPVs) to partners in less than three years, a process that would otherwise have taken eight to 10 years to develop even a single product. The allocation of the new maize products has also given partners access to CIMMYT’s parental lines and breeder seeds, so that they can continue to lead sustainable seed businesses even after the project ends. “Our intervention is the first program in Pakistan to introduce and identify biofortified maize, including pro-vitamin A, quality protein maize, and zinc-enriched hybrids/open pollinated varieties suitable for Pakistan,” Beshir said, adding that the research also led to the inauguration of the first maize stem borer mass rearing facility in Pakistan. The facility will help national programs develop maize germplasm tolerant to maize stem borer attacks. “As imported hybrid seeds are simply unaffordable to millions of small scale maize farmers, our research will enable local companies to provide affordable options to farmers,” he said. Maize lethal necrosis (MLN) disease is putting maize production at risk in eastern Africa, escalating food insecurity in the region. Jiafa Chen has helped identify new genetic resources that have been used in breeding new maize varieties that withstand environmental and biological stresses. As a maize seed system specialist, Dagne Wegary works at the nexus between breeding science and actual delivery of improved seed to farmers.